On Second Scoop: Ice Cream Reviews: Why do I keep talking myself out of buying ice cream? Why do I keep talking myself out of buying ice cream? Hey everyone! First off I want to wish you all a pleasant long weekend. I am looking forward to a few days of sleeping in and watching the parade (san commercials) and digging in to lots of tasty food (in moderation ofcourse). Now speaking of food, I have to ask, why do I keep talking myself out of buying ice cream? How can this be? 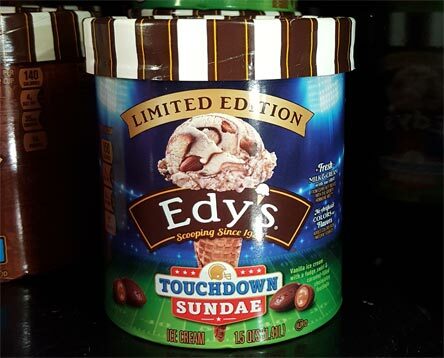 Other companies have sports teams flavors, why shouldn't Gifford's? 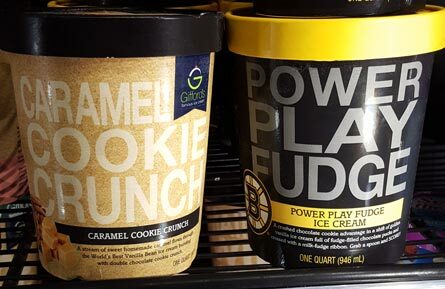 Gifford's Power Play Fudge ice cream (new for Oct 2016) is crushed chocolate cookie advantage in a shift of golden vanilla ice cream full of fudge filled chocolate pucks and crossed with a milk-fudge ribbon. Gifford's Caramel Cookie Crunch ice cream is a stream of sweet homemade caramel flowing through vanilla bean ice cream and bursting with double chocolate cookie crunch. CCC debuted in June 2014 but I'm not sure I ever see it and before looking more closely I thought it might be a Speculoos or cookie butter flavor. When 2016 started, I made the decision that I would not be coerced into buying overpriced ice cream just because it was new on the shelves. I made a point to cut my blogging budget and I did it. For the most part I would wait until the good stuff was on sale and for the least appetizing flavors I would skip them all together. This is why I only did one Breyers review this year. Oh look, Edy's redesigned this package... yet again. In a way I don't want to play the marketing game anymore. Just being new is not enough. Stop throwing things at me for the sake of throwing things at me. Have some meaning behind it. Am I singling out Gifford's with my picture above? Nope. In that particular case I just wasn't able to buy ice cream at that particular moment but in general I have found myself going to the store only to leave empty handed on purpose. I may make myself finish up whatever is in the freezer first and just wait for another day. At other times I just don't want to grab the heavier super premium that's on sale, instead foregoing the cost and calories for something else. Another failed purchase, but again it was more timing than anything. 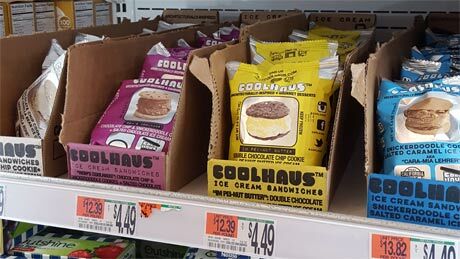 Shaws has started carrying coolhaus ice cream sandwiches at a fairly reasonable $4.49 a sandwich (I've seen them for $5.99 or more at other locations). At some point over the winter I will probably start to grab these and finally see for myself what they are all about. I guess what I am really asking is how do you feel about the current state of the freezer aisle? Do you want more new flavors? Are you sad there aren't enough classic flavors? Are you tired of heavy ice creams? Are you tired of gummy frozen dairy desserts? Are you unwilling to spend vast amounts to ship a high end product to your door? How do you feel about the ice cream scene right now? There are no wrong answers. I look forward to reading your thoughts and comments. First off, Happy Thanksgiving! I do the same thing you do. I've always refused to buy any ice cream, even my beloved TH unless it's on sale. For the most part, I straight up refuse frozen dairy dessert because I just can't stomach it anymore. For that reason, Breyers hasn't been in my house in years! As my Shop Rite is flooded with pints of overpriced gelato and novelties, I stay with the 1.5L ice cream and keep it simple. I really want to try LittleG ice cream. I saw it on Junk Banter and it looks amazing but so incredibly expensive. I think it's something like 20.00 a pint! Too be honest I haven't bought much ice cream lately, because there's hardly any new flavors I've wanted to try & sometimes the price can be ridiculous. On times I feel like inhaling a whole pint or container of ice cream I will splurge & buy Halo Top Birthday Cake. I feel for $5.99 a pint on days I can control my cravings I would rather spring for Gelato Fiasco for $5.49-6.99 since it's better quality or Talenti (to be honest I haven't bought that brand in ages). I haven't been able to find the Pumpkin Pie or Egg Nog Talenti flavors this year so far. I've wanted to try the new Ben & Jerry's cake flavor, but it hasn't seemed to make it to my local Wal-Mart. I was also bummed that Holidoodle won't be making a comeback this year from Blue Bunny. They have a few Asian specialty ice creams here in California that look pretty exciting, including one that's a Taro/purple yam flavor with bits of cheese. Other than that, I'm fairly bored at this point. The new Tillamook holiday flavors were tasty, but nothing to have a multiple repeat of, I thought. It's all just another rehash of the same 5-6 different flavors. Give me black sesame! Give me orange and pineapple! Morgan Medeiros: Have you tried Tillamook? They have Oregon Strawberry, Mountain Huckleberry, Marionberry Pie, Oregon Hazelnut and Salted Caramel, and Cinnamon Horchata. I've been really disappointed with the lack of holiday flavors ... and/or the impossibility of locating them. I would love to try the two Tillamook flavors (and Tillamook is easy to find JB my area) - but they are nowhere to be found. I'd also like to see gingerbread flavors. Cold Stone have two new flavors - but they aren't Christmas flavors, in my opinion. I'm not seeing anything exciting. I do love Hagaan Dazs peppermint bark, and finally found one container of it. I am willing to try anything, but I can't justify the price of Little G's or Ample hills, etc. HEB has Winter Wonderland, which is absolutely delish. Probably my favorite of the holiday flavors. So interesting. I almost went to the grocery store for ice cream today, and thought "nahhh". I didn't know why, but I just wasn't feeling it. I haven't seen anything new or exciting in a while. There's nothing that makes me want to eat a bowl of it by itself. Also, as I'm trying to budget a little better, I can't justify spending $4+ on a pint of impulse ice cream. All that to say- I thought it was just me! I couldn't help but notice Michi's post about an ice cream with Purple yam and bits of cheese. I know exactly what you're talking about and I've found it here in Maryland at an Asian market called the Lotte Plaza! The ice cream brand is Best of the Phillipines, right? Oh my, perhaps I'm biased since I love taro (very similar in taste to purple yam), but I loved that ice cream. Very unique and delicious. I desperately wish more taro products (especially ice cream) were available in traditional stores. Black sesame is also nice tasting in my opinion, and Mr. Green Tea company (sold in Shoprite near me) sells a great pint of the stuff! Their fortune cookie flavored ice cream, however, not as great and the cookie pieces tastes soggy. I noticed Safeway has a flavor by San Bernardo in their Tropical Escapes ice cream line called Guanaban-ahhh (Guanabana ice cream) which I couldn't resist, especially since it wasn't a ton of money compared to more premium brands. I've really been impressed with San Bernardo, honestly. That ice cream was weird but I love trying ethnic ice creams! San Bernardo's other flavors are a bit more traditional, but their spumoni and guanabana are definitely my current favorites by them. As for the regular ice creams out there, I feel like some are over rated or trying too hard and I've been purchasing less Turkey Hill, Edy's, Breyer's, etc than I have in the past. I've also been less tempted to pay $5+ for a "premium" ice cream. However, those lower calorie ice creams out there (Halo Top, Enlightened, and So Delicious' no sugar added coconut milk pints) are my weakness and I spend at least $25 a week on them... at least. Just don't make me eat Arctic Zero and I'm good! to the anons: yeah, I'm not forking over $109+shipping for six pints of ice cream, I don't care how good it is. If you've got the cash flow and the desire, more power to you, but for me, I just can't do that. @latchkey: winter wonderland looks crazy! that is one unique winter treat. @morgan: one sampling was enough to never make me want licorice ice cream again! @michi: are you talking about magnolia ice cream by chance? I buy whatever is the lowest price but that is because I budget my money. I will not want to spend a lot of money on a food that is meant to be a dessert and that has practically no nutritional value. I don't care if it's generic, gummy, labeled as a frozen dairy dessert, or has no mix-ins, I buy whatever I can find at the lowest price. There is nothing wrong with the classics like plain vanilla or plain chocolate. If it's sweet, that's all I need to satisfy my sweet craving. I enjoy frozen desserts and ice creams, generic and premium. Totally fine with having Baskin Robbins or a Blizzard at DQ. My love for Thrifty ice cream when I'm home in California is everlasting with the nostalgia of childhood. If I'm at a small batch premium scoop shop like Salt & Straw or Sweet Rose Creamery, I'll go for split/kid's scoops of one specialty flavor and one classic. I find that whenever I browse through the freezer section, some just have so many mix-ins it becomes almost overwhelming. I love B&J's Mint chocolate cookie, but could do without The Tonight Dough. McConnell's and Graeter's have great quality and selection, but I'm drawn more towards how well the companies make familiar flavors including those with one or no mix-ins at all. Simple but excellent quality. Thanks for the honesty in all your posts. Shipping premium ice cream just isn't a luxury I will pay into at this point in time. I'd rather try them if I happen to travel to the region where they are sold as it adds to the experience of the journey! I've had a bit of a reset myself with ice cream. I'm exploring aisles again after moving to a new state. Trying what peaks my eye, and trusting the wisdom here about brands that may be new for me. Blue Bunny has been a go to for me lately ( love the new Seasonal Peppermint Party), for both budget friendly and hitting my sweet desire. I don't buy anything with GMOs or artificial ingredients or fillers. So that tends to place me at the high end of the price range. Organic brands or Ben and Jerrys and certain GMO free Haagen Dazs flavors. I dont consider price at all because food is so cheap in America IMHO and even the most expensive is what? $5? Thats like nothing. Where else would you get 1000 calories for 5 bucks than ice cream? @Denise: nothing wrong with the classics! @Anon: I always try to hit a few grocery stores when I'm in a different state just to see what's different! Just picked up the Gifford's Power Play. Couldn't pass it up for $2.49. But I do hate paying the premium prices for premium ice cream all of the time.